Here are the things that are all around the house that I realized were for holding the porch to the house. They are located at porch foot level and also at porch roof level. I have no idea if they are original to the house but I thought they were cool. 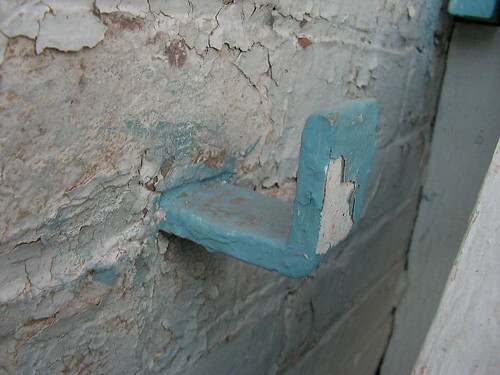 the house hooks, originally uploaded by Blair Necessities. I took a bunch of pictures of other things and am working on the tales of them. When I finish unpacking sometime next year (if I am lucky) I will find a copy of what the house looked like way back when it was built. I have to say that this process is taking a very long time. We are still working on the living room, and I just can't believe it is taking this long. I love this house and I am so glad that it is ours and that I can take care of it. I just wish I had a sense of accomplishment with it, I want to have a living room with out a view of the mud dobbers and bare window panes... but that is just me wanting to see it done and being able to decorate it to its glory! On a side note, my aunt, the artist, had a fundraising exhibition at her gallery for a local historical society. When they found out that we owned this house they were thrilled. We might get an article in the newspaper about the house. We also found out that it seems that the city restoration grants have a proviso of passing ownership on to the city... sad isn't it... However, the rules may have changed. But if they haven't I sure won't be sending in an application. Does anyone know of other ways we can find grants for this restoration/renovation?